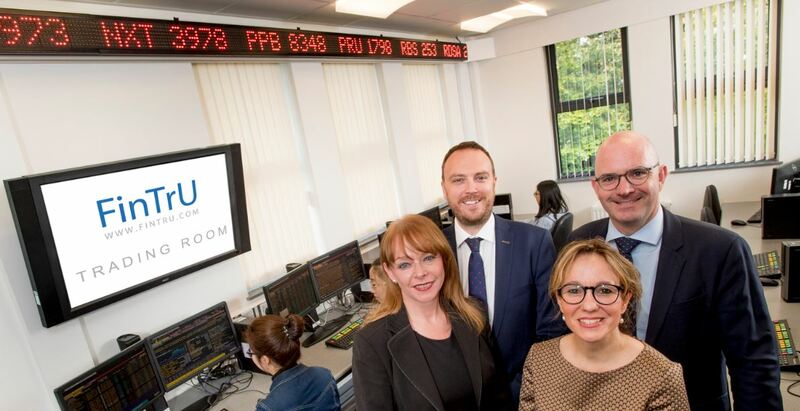 Northern Ireland’s first financial Trading Room, based in Queen’s Management School, has announced a new sponsorship partner. FinTrU, a leading financial services company present in Belfast since 2014, has committed £75,000 to support the facility over the next three years. Students in ‘The FinTrU Trading Room’ have access to all the latest financial data, news and analytics – and to Oxyor, a trading simulation – putting them in the dealing room ‘hot seat’ and providing a dynamic environment for those hoping for a career in financial services or technology. FinTrU now employs over 200 people in Belfast and already supports a finance lecture series at Queen’s. The company provides High Quality, Cost-Effective Resourcing for Financial Services, with emphasis on Legal, Risk, Compliance, KYC, Operations & Consultancy. Commenting on the partnership Professor Nola Hewitt-Dundas, Head of Queen’s Management School, said: “The FinTrU Trading Room provides an excellent opportunity for Queen’s students to gain first-hand experience of a trading environment, dealing in real-time equities, bonds, foreign exchange and derivative instruments. “FinTrU already employs large numbers of Queen’s graduates. This latest development will further bolster the local financial services sector and help us to deliver a highly skilled and flexible employer-attuned workforce capable of working in very competitive global markets. CEO and Founder of FinTrU, Darragh McCarthy, said: “We are delighted to build on our relationship with Queen’s by supporting this unique Trading Room facility. “At present over 50 per cent of our Belfast team are Queen’s graduates. This special partnership underlines our commitment both to the University and to the financial services sector in Northern Ireland. The FinTrU partnership also includes title sponsorship of the Finance Research Seminar Series each academic year and a one-day workshop in Corporate Finance, the first of which will be held in April 2018. The FinTrU Trading Room, which replicates New York and London trading environments, is based at Queen’s Management School at Riddel Hall. It will give up to 24 students at any one time access to 12 trading stations and to a real-time electronic ticker tape featuring financial information feeds from Bloomberg. Two large-screen displays in the FinTrU Trading Room provide live coverage of CNBC, CNN, and other financial networks, and software for trading, analytics, portfolio management, and other finance-related challenges. The first-hand experience of the high-pressure atmosphere of the trading room available to Queen’s finance students, will give them even more of an edge in the global job market. Further information on FinTrU and Queen’s Management School is available online. Inquiries to Gerry Power, Communications Officer, Queen’s University Development and Alumni Relations Office; tel: +44 (0)28 9097 5321. Photo caption (L-R): Professor Nola Hewitt-Dundas, Head of Queen’s Management School, Richard McGuinness, Managing Director, Head of Operations at FinTrU Belfast; Katrien Roppe, Chief of Staff at FinTrU; Darragh McCarthy, CEO and Founder of FinTrU.